Oliver Nelson was born in Glasgow and began learning the violin at the age of six. He gained scholarships to both CanfordSchool and the Royal Academy of Music. During his time at the Academy, Oliver studied the violin with Xue-Wei, conducting with Denise Ham and Colin Metters and appeared as leader and soloist with the Academy String Orchestra. His achievements include winning the Academy Concerto Competition, the Winifred Small Violin Competition and the building of his concerto repertoire with orchestras such as the Christchurch Sinfonia, Da Vinci Ensemble, Dorset Youth Orchestra and Gli Amici Della Musica. He is now in high demand as a recitalist with Roy Stratford and Andrew Ball with recent performances at St. Martin-in-the-Fields and St. James’s Piccadilly in London. 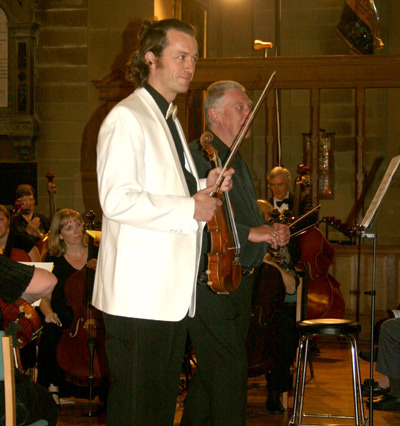 He has appeared as soloist with orchestras in this country and abroad including the Amaretti Chamber Orchestra, Dorking Philharmonia, Dorset Chamber Orchestra, Gorton Philharmonic, Hertford Symphony Orchestra, High Peak Orchestra, Manchester Beethoven Orchestra, Unley Symphony Orchestra of Adelaide, Wilmslow Symphony Orchestra and the Winchester Symphony Orchestra. His concerto appearances range from performances of the Bruch Violin Concerto No.1 at both the Royal Scottish Academy of Music and Drama in Glasgow and Central Hall during the Edinburgh Festival, the Tchaikovsky Concerto in Adelaide, Australia, and Mozart Concertos 3 and 5 with the Royal Oman Symphony Orchestra in Muscat, Oman. With the latter orchestra, Oliver was invited as soloist for a private performance for the Sultan of Oman in his palace. In 2015 Oliver is engaged to play the Tchaikovsky concerto in both Buxton and Dorset. Oliver also leads a busy life teaching at The Royal School and Hindhead Music Centre in Surrey and is regularly involved in adjudicating, coaching and masterclasses.